We will create our background using Tim Holtz Distress Oxide inks. We will use various techniques including blending colors including colors that do not normally mix, adding water, drying with heat guns. Layering will continue with stenciling, splatter and rings. Focal point will be created as we discuss collage. We will use dictionary paper, stamped images, tissue paper and other mixed media elements. **Please bring your heat guns in addition to your basic mixed media supplies. **Basic supplies would include splat mat, water spritzer, stamp block, paper towels, wet wipes, paint brush. 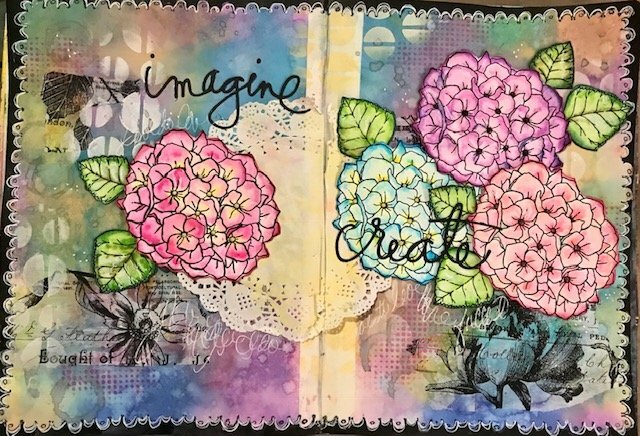 If you're new to mixed media, don't worry about supplies, just come. We've got store supplies to get you started.